All of the amenities, none of the work to get them! Welcome to 10036 E. Cedar Waxwing located in Sun Lakes with 3 bedrooms, 2.5 bathroom home with 3,166 square feet on 2 levels. 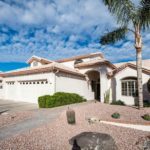 A move in ready home with stunning views of the entire Sonoran golf course hole #8. Your main floor gives you the master suite, spacious kitchen featuring granite and a huge center island, overlooking the center point of the home, your family room that offers large windows overlooking the golf course. The second level gives you 2 guest bedrooms and a full bath. Many upgrades inside included added lighting, high-end light fixtures, 20” tile flooring, and SS kitchen appliances. Outside you’ll find a 3 full car garage with attic storage, garage floor coating, tons of storage and a catwalk. Fall in love with Arizona sunsets in your backyard haven! Get ready to relax outside on the large paved patio with plenty of space for your friends and family. With the amazing view of the hole 8, Sonoran golf course, and a low maintenance landscaping, there’s nothing for you to do but enjoy! 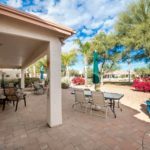 Loving in Sun Lakes is like living at a resort with golf, tennis, pickle ball, fitness center, restaurants and so much more. This seller LOVES her home but most of all she LOVES the neighborhood. Don’t hesitate on this one, it WILL NOT LAST!